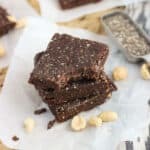 Five-ingredient Chocolate Peanut Butter Chia Bars are an easy, no-bake recipe for healthy snacking! These bars are vegan and naturally sweetened. Line a rimmed dish with parchment paper and press mixture into it, leaving your desired thickness. I used only about half of an 8" x 8" baking dish as I didn't have a smaller dish available. I suggest using a no-stir peanut butter variety to prevent the bars from being too oily. If using a peanut butter that features a layer of oil on the top in the jar, I would stir it up very, very well before adding to the recipe. Total recipe time includes 45 minutes of inactive chilling.